Taught 2nd and 3rd grade reading, writing, and english. Also typed and composed midterm exams and proctored them to the kids. School started at 7am and ended around 4pm. How friendly the people were. Rwandan people are very different from the people of other parts of Africa. They are much more respectful and considerate. They're also very inviting and glad that you are there and want to know more about you and your experience. I was also shocked by the degree of safety of the country-- I never felt unsafe once! 3- What was most difficult to experience? How can new volunteers prepare better? Acclimating to the amount of walking and the food. You can't really prepare for situations like that, other than bringing some protein bars and comfortable shoes. a.- It is really easy to grab a bus right off the road the school is on and take it to the market in Rwamagana, which is 5 minutes away, or to Kigali, which is an hour away, or Uganda, a few hours away, or Tanzania, which is only a few hours away, too! b.- The food is very basic; posho and beans for lunch, and rice and beans for dinner, every day. c.- Rwanda is very mountainous and you have to walk quite a bit to get to the road, so make sure you have clothing and shoes that are comfortable. d.- Rwanda is very safe- something a lot of people worry about when traveling to Africa in particular is the safety of the country. I have traveled to West Africa and felt unsafe at times. However, in Rwanda, even on the back of a stranger's motorcycle in Kigali, I never felt anything but unsafe. 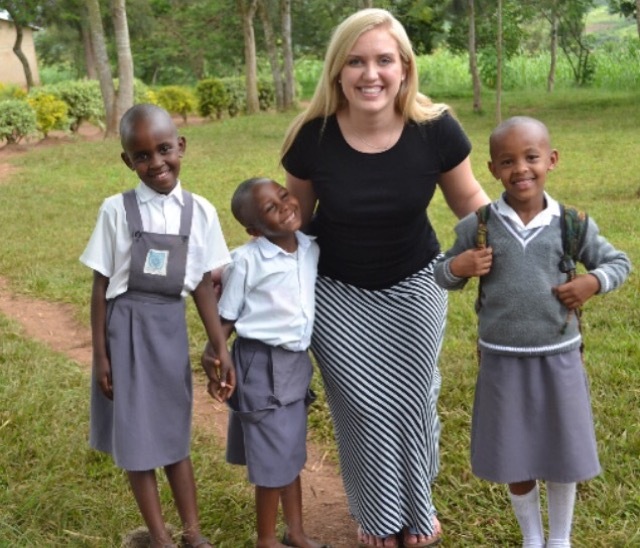 Volunteering in Rwanda further augmented the love that I have for Africa. Teaching at the Primary School was a great experience- teaching english, reading, and writing presented its challenges, but there's nothing more gratifying than your P2 kids finally grasping the concept of comparative adjectives. Volunteering wasn't all work either; during free time, nothing brought me more joy than being able to teach the kids elementary American games like Duck, Duck, Goose, hangman, and Heads Up. Rwanda is a great place to visit and volunteer, the experience will have a lasting impact on your life; how many people are able to say they came 10 feet from a live giraffe, or have ridden on the back of a motorcycle in Rwanda's capitol? 6- How would you describe your accommodation, meals, security (e: host family, on-site, shared). The accommodations were great for Africa! I had a room to myself in the school's dormitory, so I lived with the kids, too. They had a matron that cleaned every day and locked up at night. The school itself, which is maybe 100 feet from the dorm, has a night watcher, or night security guard. They supplied a mosquito net, as well. I ate a protein bar right before my classes, so I'm not sure what they eat for breakfast. Lunch at the school was always ugali a.k.a posho with beans, and dinner was rice and beans. The headmistress was very nice and accommodating and made sure I was feeling comfortable and had everything that I needed. Finding a favorite memory is hard, so many lasting memories were made. One would guess my favorite memory would be riding on the back of a motorcycle in Kigali overlooking the country's rolling hills, or going on a safari and seeing zebras, giraffes, and hippos, but for me, they don't come close to the relationships I made with the girls that lived at the Insinda school. Memories of them singing songs, of the American dances I taught them, of the piggy back rides I was begged to give, of the hundreds of bubbles they blew, or the countless braids that slowly took over my hair, there isn't a singular memory that stands out because every memory with the girls and the kids themselves are the greatest and most unforgettable memories. 8.- How was the ABV USA support prior traveling? Did you feel well prepared? Would you recommend any changes/improvements on getting volunteers ready to travel abroad? ABV was great before traveling. However, my sister was already in Rwanda before me, so I got most of my information from her and asked her any questions that I had. I have also been to Africa before, so I kind of knew what I was in for. However, I did feel prepared in the sense that ABV had provided transportation from the airport and had a place for me to live and volunteer.